So, it’s making your mind up time, in the chirpy words of Bucks Fizz from an era when we weren’t winning many Olympic medals in cycling but at least we brought the Eurovision Song Contest home. And just like in 1981, when Bucks Fizz beat the German entry by just four points, this is a difficult one to call. As we pointed out in the intro, apart from their nationality, their RRP and the curvature of their bars, these bikes are quite different. And cycling is full of sub-categories and subdivisions not to mention subcultures so it might seem as though we’re comparing apples to oranges — but actually the way the ratings work doesn’t require any of the bikes to be fit for a specific purpose. Really it’s all about whether they’re any good or not for the amount of money they cost. The Raleigh had handling difficulties and in another test we might have popped in another fork to see whether that solved its strange steering characteristics, but a bike buyer who has paid getting on for £1,000 in good faith shouldn’t have to do that, so we had to mark it down. The Charge Juicer Hi is a bit like a house that is decorated to the owner’s particular — and in this case slightly idiosyncratic — taste. Not everybody is going to like it and even though it’s blue, conservative cyclists won’t look at it. The estate agent tells you to redecorate in neutral colours if you want any viewings at all. And underneath the ironic retro dark-blue paint is a great steel frame waiting to be appreciated by cyclists who aren’t hipsters and don’t want to pay to have it resprayed. Also, despite fettling, the mudguards wouldn’t run silently and the brakes and chainset were not what you expect on a bike costing £1,000, so this time no cigar for Charge. The Forme is a super package and it’s hard to find fault with it — in fact we haven’t. It’s a great bike and looks stylish with its smooth welds and striking black/white paint scheme. It has a super-solid feel on the road, but slightly lacks zip. With the frame made from triple-butted 7005 aluminium with mostly 105 equipment it ought to be a bit lighter and zippier to ride. 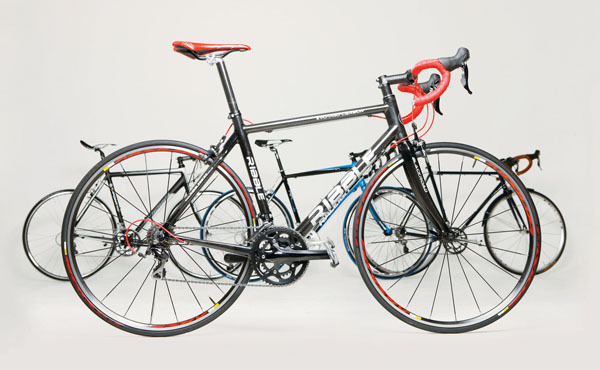 Whereas the Ribble could probably challenge YKK for zip. We’ve noted that its carbon frame (the only one in this test) is not as stiff as some people might want it to be — especially if racing is on the agenda — but it has an exuberant whippiness that can give your cycling a big lift if you’re used to riding a more utilitarian bike. The complete 105 groupset gives it a great sense of coherence and our test bike looked the part too. And it’s more than a tyre’s breadth ahead of the others in value-for-money terms. The Ribble is not a bike for all seasons but if you’re taking your cycling seriously (and have the storage space) you should have a ‘hack’ bike with mudguards to ride through the winter anyway. So, another gold medal for Britain.